Researchers have long struggled to find an answer. Everyone agreed that there was a likely genetic link, but past that, we’ve only been able to speculate as no single research study had produced conclusive findings. Now, a recent study out of Japan has examined whether physical activities and lifestyle factors were directly related to adolescent idiopathic scoliosis (AIS). 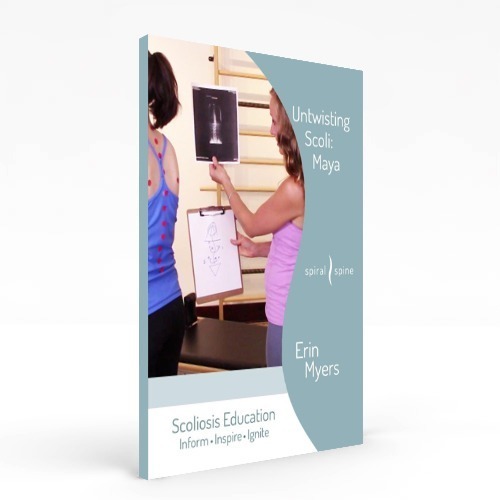 This particular study is by far one of the most comprehensive scoliosis studies that I have come across. Not only is the two-year study non-biased, it includes some 46 references to other scoli studies in the discussion section of its report. The complete details of the study can be found here. *With respect to classical ballet, AIS was associated with the age in which the child began training, primarily prior to seven years old. As the child’s years of ballet training, frequency of dancing, and duration of participation increased, there was a clear trend toward an increased odds ratio for AIS. Wow. Ballet, BMI and braces? I felt like this study was speaking directly to me. I was classically trained in ballet from a young age, I was tall and lean, and I had braces on my teeth. In hindsight, the odds were stacked against me. Interestingly, the orthopedic surgeon I saw in high school after I was diagnosed with scoli, actually told me to keep dancing because it was “strengthening my back” and it was “good for my scoli.” Obviously, the results of this recent study contradict that theory. And although I can’t change the past, I passionately believe that the results of this study should be widely read and disseminated, so that anyone dealing with scoli knows what the potential risk factors are. My past has made me who I am today. My ballet training led me to become a Radio City Rockette; and when I was injured while dancing with the Rockettes, that led me to discover Pilates. Pilates has opened up a whole world of strength, flexibility and rehabilitation that allows me to share my knowledge of movement with others. I wouldn’t change anything about my journey! So, what do we do now? Do we live in fear, pull our girls out of ballet, insist that they overeat until they become unhealthy and then shun braces for their crooked teeth? If I had a daughter who desperately wanted to dance, I would allow her to do so, but I would also be very aware of the risk factors associated with ballet and scoliosis. I would speak with her dance instructors and make sure they knew how to identify misalignments in her body, and to monitor any changes. I’d also suggest they use a scoliometer to check their students for any spinal curvatures every month or so, and to record those readings for future comparison. These two adjustments alone could go a long way in proactively identifying scoliosis. And chances are if your daughter does dance, she probably has a low BMI (most serious dancers do). So now you have two elevated risk factors for scoliosis (ballet + BMI). And guess what? Right about the same time, many pre-teen and teenage girls get braces to straighten their teeth. This makes three elevated risk factors for scoliosis: ballet + BMI + braces. If braces are indeed necessary, ask your orthodontist about the least invasive options for your child’s teeth while she continues to go through puberty and her spine is still growing. The bottom line? Be informed. Know and share the scoli risk factors that this study details. Tell your pediatrician, orthodontist, dentist, school nurse, other dance moms, dance teachers and more. The more people who are aware of the risk factors, the better decisions that can be made for girls’ spinal health. And maybe, just maybe, we’ll see less cases of scoliosis altogether.